Smoke rises from police headquarters while Afghan security forces keep watch after a suicide car bomber and gunmen attacked the provincial police headquarters in Gardez, the capital of Paktia province, Afghanistan October 17, 2017. KABUL - Taliban militants struck government targets in many provinces of Afghanistan on Tuesday, killing at least 69 people, including a senior police commander, and wounding scores of others. The deadliest attack hit a police training centre attached to the police headquarters in Gardez, main city of Paktia province. Two Taliban suicide car bombers paved the way for a number of gunmen to attack the compound, officials and militants said. At least 21 police officers were killed, including the Paktia provincial police chief, with 48 others wounded, according to government officials. The attack also left at least 20 civilians dead and 110 wounded, the Interior Ministry said. Security forces killed at least five attackers. 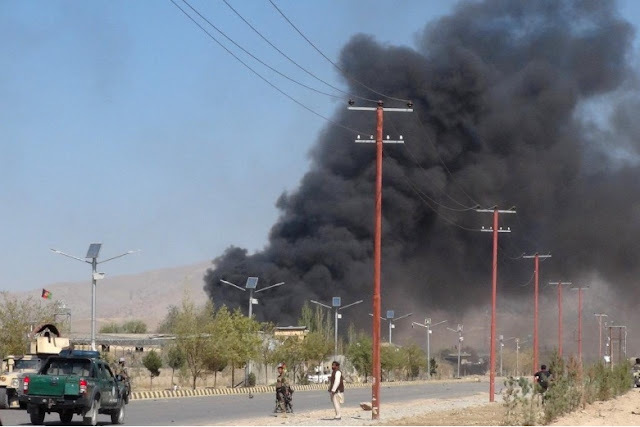 The militant group also attacked a district centre in neighbouring Ghazni province on Tuesday, detonating an armoured Humvee vehicles packed with explosives near the provincial governor’s office. Fighting was also reported near local government centres in Farah and Kandahar provinces. Taliban militants struck government targets in many provinces of Afghanistan on Tuesday, killing at least 69 people, including a senior police commander, and wounding scores of others. The deadliest attack hit a police training centre attached to the police headquarters in Gardez, main city of Paktia province.